A high level of economic disparity and low level of economic mobility. Any citizen concerned that America is stalked by the phantom of plutarchy must concern himself with these portents of democratic decay. Of the two evils, I find social immobility to be the more disquieting. Traditionally, Americans have had a high tolerance for economic disparity. Why fault the filthy rich when your children had a winner's chance of joining their ranks? Indeed, the firm belief that ours is a land that rewards those who live here on the basis of brains, industry, guts, and luck, not birthright or social connections, forms the bedrock of the national ethos. It is the American Dream. To be pithy: The erosion of this dream is the greatest danger American society now faces. Therefore, those concerned with health of the Republic have a vested interest in understanding and explaining the source of this erosion. A meme to this effect has been bouncing around the blogosphere of late. The meme, which I have endorsed, can be summarized as follows: in America the most direct avenue to power and influence is an education from one of the nation's elite schools. Beyond the generally superior education these institutions offer, an education of this type allows students access to the social networks that link America's 'biggest' journalists, analysts, bankers, business executives, politicians, and thought-leaders. In terms of social mobility, the colleges churning out "the best and brightest" have the potential to serve as bridges between the classes, opening doors of success to smart and hard working students from the poorer sections of American society. Meritocracy in action. The problem is that this has not happened. As most readers are probably aware, the last decade has seen college tuition rates soar to heights previously unknown. If they were not before, the best private institutions in the country are now beyond the price range of the all but a tiny minority of Americans. The upper middle class has been particularly hard hit; unable to qualify for financial aid offered to students from low-income families, students unwilling to rack up dangerous levels of debt have found themselves blocked from social advancement. When the reasons behind these tuition increases are considered, it is difficult not to see this as an inadvertent move to solidify the existing social structure. Plutarchy in action. That is the narrative. As it turns out, it is a narrative with some holes. LFC, a frequent commentator here at the Stage and other related sites, has objected to this argument (in several different forums). The problem with this meme, says he, is its premise: no one has produced any evidence that links Ivy League attendance to positions of power and influence. Absent hard data, we are working with perceptions, not reality, and there is no particular reason to believe that these perceptions are accurate. It is a fair point. This author has been eager to make claims about these institutions absent data necessary to back these claims up. This post is an attempt to provide such data. Below is a breakdown of the educational background of a group of people who are unambiguously members of the elite: the 100 men and women who currently compose the U.S. Senate. Unless otherwise noted, all information recorded below comes from Scientists and Engineer's for America's list of Congress members by degree. Only six universities awarded degrees to more than two Senators; no university has awarded degrees to more than seven. When double degrees are accounted for, 18 Senators (18% - or approx. 1 in 5) graduated from an Ivy League school. 20 Senators (20% - or 1 in 5) graduated from the 12 universities ranked highest by U.S. News and World Report. While it cannot be seen in these figures, there was a clear relationship between institutions granting more than one degree and the type of degree being awarded. By and large, graduates from universities with more than one Senator alumni graduated in the fields of law, political science, history, or other social sciences. Senators who graduated from engineering, business, medicine, or natural science programs were dispersed amongst a much larger number of institutions. Several conclusions can be drawn from this data set. To begin with, it is clear that these institutions do matter. One fourth of all Senators attended schools that can be uncontroversially described as "elite." Harvard is the big winner here; if these numbers are anything to go by, a student attending Harvard University is seven times as likely to become a Senator than a student attending any of the 53 universities not found on the table above. If you wish to become a member of the U.S. Senate, Harvard Law would not be a bad place to start. Yet the fact that there are 53 universities to compare to Harvard cannot be ignored. An Ivy education may help the ascendence of the young Senator-to-be, but it is hardly the only path to Capitol Hill. Elite as they may be, Princeton, Brown, and Cornell sent no more graduates to the Senate chambers than did Louisiana State or Huntington College. As far as the Senate is concerned, graduation from the nation's top universities is no ticket to political power. Caution is advised in applying the results of this study (if it can be called such) to the wider problem of American social mobility. The Senate was examined not because it is an accurate cross-section of America's "ruling" class, but because the information concerning Senate members was easily accessible. While this made crunching the data rather easy, it poses several problems for the broader application of these results. The first such problem is the age of the population being considered. The Congressional Research Service reports that the average age for Senators in 111th Congress is 63.1 years old. This means that most of these men and women would have graduated in the 1970s. The quality and prestige of various universities has fluctuated since then. What was a prestigious pathway to the upper class in 1973 might not be so now; conversely, institutions not ranked highly on this list might be ranked very high on a list composed when today's newly-minted graduates are themselves venerable members of the Senate. The Senate's method of selection also poses problems for further extrapolation. Members of the Senate are chosen by democratic procedure. They get their jobs by campaigning. If Senators are not sanctioned by their non-upper class constituencies, they will lose this job. And the electorate has done a fair job of ensuring that the Senate is not composed of one giant ol' boys club. This is a testament to the enduring power of our democratic institutions, even when weakened by citizen apathy and plutocratic manipulations. But what of those whose power was not bestowed by the people, those whose careers are untouched by the pressures of populism? One of the more striking trends of the last 40 years has been the steady diffusion of power away from elected officials towards administrators, aides, and bureaucrats whose job security is not threatened by the ill graces of their fellow citizens. In most cases, it is with these men that true policy making power lies; regulators, congressional aides, and second tier officials at the White House and Pentagon are the men who transform the rhetoric of their superiors into working laws, regulations, procedures, and policy postures. I believe that an examination of these men and women would provide a more telling window into the workings of America's ruling class than this breakdown of the Senate. Unfortunately, information on these men and women is difficult to acquire; not being subject to election, no one has bothered to collect the demographic data of the American bureaucratic class. Given this dearth of empirical research on the matter, this author advises to caution to all who would make definitive claims concerning the composition of America's "ruling" class. I know that more than a few of my readers have a penchant for strategic thinking. To these I suggest a website just added to the Stage's blog roll, Grand Strategy: The View From Oregon. "Geopolicraticus", the author of this blog, writes with the "intention to view geopolitics through the prism of ideas." To this end he is remarkably successful, and his blog is a whirlwind journey through history, strategic thought, and philosophy. If you do not mind large doses of theory intermixed with analysis, I recommend giving Grand Strategy a read. Below I have linked to a few of the posts from Grand Strategy that I have found to be particularly thought provoking. Daniele Fanelli. PLoS ONE. 21 April 2010. The objectivity and integrity of contemporary science faces many threats. A cause of particular concern is the growing competition for research funding and academic positions, which, combined with an increasing use of bibliometric parameters to evaluate careers (e.g. number of publications and the impact factor of the journals they appeared in), pressures scientists into continuously producing “publishable” results. Many factors contribute to this publication bias against negative results, which is rooted in the psychology and sociology of science. Like all human beings, scientists are confirmation-biased (i.e. tend to select information that supports their hypotheses about the world) and they are far from indifferent to the outcome of their own research: positive results make them happy and negative ones disappointed. This bias is likely to be reinforced by a positive feedback from the scientific community. Since papers reporting positive results attract more interest and are cited more often, journal editors and peer reviewers might tend to favour them, which will further increase the desirability of a positive outcome to researchers, particularly if their careers are evaluated by counting the number of papers listed in their CVs and the impact factor of the journals they are published in. Having established the general bias in favor of positive results, Fanelli proceeds to analyze the results by the location of their authors. This is where things are most intriguing. The percentage of published articles that confirm the hypothesis varies considerably (25%-100%) from state to state. 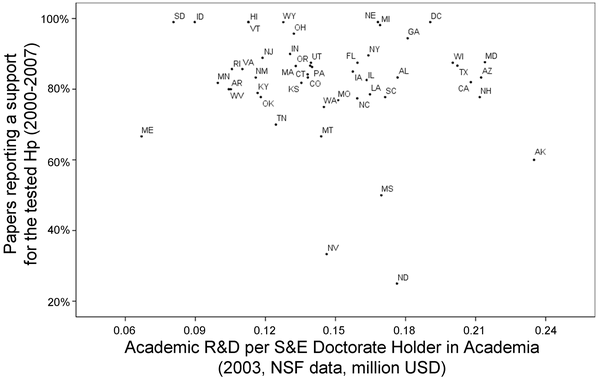 “Positive” results by per-capita R&D expenditure in academia. [Studies were] more likely to support a tested hypothesis if their corresponding authors were working in states that produced more academic papers per capita. This does not mean these positive results were fabricated; as the author notes, it is more likely that hypotheses were changed to match the data after observations had been recorded or experiments conducted. This, combined with negative results that were simply unpublished, should account for most of the positive bias in 'competitive' states. Most interestingly, Fanelli reports that this model varied little by discipline. The two exceptions were toxicology and neurology, which 'had a significantly stronger association between productivity and positive results' than did other sciences, such as ecology or space science. The authors admit, however, that the sample sizes for these disciplines are too small to preclude chance. A more thorough analysis of bias, discipline, and productivity is a project reserved for the future. How Many Scientists Fabricate and Falsify Research? A Systematic Review and Meta-Analysis of Survey Data. Daniele Fanelli. PloS One. 29 May 2009. Another article by Fanelli on a similar topic. I trust that it will be no less interesting to readers of The Stage. I have been a little busy this last week. Odds are that I will be busy over the next week as well. The wait should be worth it, however – I have written drafts of several posts that might just pique the readership's interest. Later this week I should have time to hammer down their specifics and get them published. In the meantime, I direct my readership to this post by Noah Millman (H/T League of Ordinary Gentlemen). It has been noted before that the smartest people don't seem to fit nicely into boxes labeled "left" or "right." This says more about our our method of classification, I think, than it does about these people themselves. It seems clear to me that a new taxonomy is needed to replace our old system. Liberal vs. Conservative – "Put simply: a liberal outlook trusts individuals and questions authority; a conservative outlook distrusts individuals and defers to authority." Left vs. Right – "Put simply: a right-wing perspective is animated by an affinity for the winners and their interests, while a left-wing perspective is animated by an affinity for the losers and their interests." Progressive vs. Reactionary – "The progressive-reactionary axis revolves around attitudes toward time and history. The progressive is future-oriented. Things will – or could – be better in the future than they are now. But more than this, history has a direction that can be discerned, and that one must be cognizant of in constructing one’s politics....The reactionary, by contrast, is past-oriented. Things will – likely – be worse in the future than they are now, just as they were better in the past." So what do you all think? Is this breakdown better than the current left/right dichotomy? Where do you fall on the Millman Political Taxonomy? The author announces his intent to take Sundays off. The Hebrews were on to something with this one. A day set aside for reading, rest, spiritual edification, and general recuperation will do a man good, and it is not something he can get when participating in inflammatory online debates or ceaselessly monitoring the constant stream of information rocketing across the internet. As I have the unfortunate tendency to do both whenever blogger is opened up, I have decided that it is best if I remove the option entirely. From this point forward, I respectfully ask the readership not to expect replies to comments until Monday morn. This week has not been a pleasant one for Hamid Karzai. Following an embarrassing outburst where he declared, among other things, “I might join the Taliban”, Western media outlets have kept up a steady barrage of open editorials lampooning the President. Foreign Policy, Slate, Small War Journal, The Weekly Standard, the Huffington Post, and Politico all published articles declaring the President to be "crazy", "unhinged", "mad", and "erratic." Simple name calling was not enough for The New York Times, which decided to up the ante with a more ambitious headline: "How to Save Afghanistan from Karzai". Even the NATO press office piled on, accusing Karzai of "Undermining the Alliance's Efforts in Afghanistan". These are serious charges, are they not? To call an ally mad is no slight thing. Nor is branding a head of state an enemy to his country a light matter. I find that these accusations, so freely given, say more about the accuser than the accused. Washington never can take responsibility for problems of its creation. Gareth Porter. Asia Times Online. 17 April 2010. That is what Karzai said to a shura of between 1,000 and 2,000 Kandahar province tribal elders on April 4. Karzai said NATO's Kandahar operation would not be carried out until the elders themselves were ready to support it, according to a number of press reports. According to the report by RTA, Afghanistan's state television service, Karzai actually said, "I know you are worried about this operation," before asking their opinion. He also said that the shuras to be organized at the district level were for the purpose of "getting approval and deciding" on the operation, according to the RTA report. According to the RTA account, one elder interrupted Karzai to say, "Who are the Taliban, but my son and another's nephew? The problem is actually these people who are in power, in particular the tribal elders and those who have power in Kandahar city." Sarar Ahmed. AFP. 4 April 2010. Speaking on a high-security visit to Kandahar city with the head of coalition forces General Stanley McChrystal and top NATO official Mark Sedwill, Karzai said: "These days the foreigners speak of an operation in Kandahar. "Are you worried?" he asked hundreds of local tribal elders, who shouted back: "Yes, we are." "Well, if you are worried, then there won't be an operation unless you are happy about it," Karzai responded, adding that all local leaders would be "consulted first and there will be an operation to bring security". To recap: President Karzai hosts a shura with Kandahar’s tribal leadership. During this meeting he pledges that no offensive will take place in their homes, on their lands, or in their villages without their consent. They proceed to deny this consent. What is the ISAF’s response? WASHINGTON - The United States military has now officially backtracked from its earlier suggestion that it would seek the consent of local shuras, or consultative conferences with those elders, to carry out the military occupation of Kandahar city and nearby districts - contradicting a pledge by Afghan President Hamid Karzai not to carry out the operation without such consent. Lieutenant Colonel Tadd Sholtis, a spokesman for General Stanley McChrystal, the commander of US and North Atlantic Treaty Organization (NATO) troops in Afghanistan, told Inter Press Service on Tuesday that local tribal elders in Kandahar could "shape the conditions" under which the influx of foreign troops operated during the operation, but would not determine whether or where NATO troops would be deployed in and around the city. A counterinsurgency, we are often reminded, is only as effective as the government it is trying to protect. The key word here is legitimacy. If the population believes the government to be illegitimate and unlawful, it will lend support to insurgents attempting its overthrow. If the government is perceived to be legitimate, then the populace has little need to harbor insurgents. In this sense, COIN can be boiled down to exercises in glorified state building. I jest - but only just. Population-centric counterinsurgency theory is a bit more complex than this characterization allows. The central point, however, is unchanged. The success of a counterinsurgency ultimately rests on the legitimacy of the governing institutions the insurgent wars against. Which is why so many people dislike President Karzai. The President has surrounded himself with warlords. He comes from a family rolling in drug money – and uses his position to ensure that none of them will ever be prosecuted for it. Corruption is ubiquitous in his administration. These things, say Western diplomats, soldiers, analysts, and newsmen, undermine the legitimacy of the Afghan government. The Karzai administration has too much bribery, blood, and drugs in its past to serve as the face for a legitimate Afghani national government. This criticism misses the mark by a mile. Afghanistan has been in various states of insurgency, civil war, and religious repression for more than 30 years. In such an environment anybody in a position of power has blood on his hands and dirty money in his pockets. You will find no paragons of virtue ready to step up and do the West’s bidding on either side of the Durand line. This is a reality. Sadly, it is a reality Americans ignore. Its implications, its seems, are simply too painful to accept. Westerners like to think that a legitimate government must be based on the rule of law. This idea is bizarre. Our times are witness to many a government ruled by men who are nonetheless completely legitimate in the eyes of those they govern. On the surface, these governments maintain their legitimacy by providing what the people desire. Welfare. Moral authority. Peace. And so on. But legitimacy is not just about the goods. It is a matter of expectations. Governments are not legitimate because they provide the services desired by the populace – they are legitimate because the populace trusts their ability to do so. This is the core of legitimacy. Can you trust the government to work for your interests? Can you trust government officials to keep their commitments? It all boils down to trust. And trust is exactly what President Karzai does not have. But whose fault is this? Do the people of Kandahar distrust their President because he held a shura to consult with his constituents? Do they distrust President Karzai because he promised to bring his policies in line with their interests? Is this why Karzai lacks legitimacy? Or do the people of Kandahar distrust their government because the promises it makes inevitably prove to be a worthless shams? We treat Karzai like a dog. We ask him to jump through our hoops, to align his policies with foreign whims. We tell him to strengthen government control over the country, and then reprimand him for strong man politics. We continually force him into situations where he must undermine his own promises and obligations. And then we complain about his 'lack of legitimacy'. Pray tell me – who is the crazy one here? In most European nations, the initial movements of power resided with the upper echelons of society and passed gradually and always in a partial manner to the other sections of society. By contrast, in America we can state that the organization of the township preceded that of the county, the county that of the state, and the state that of the Union. – Alexis de Tocqueville, Democracy in America, trans. Gerard Bevan, p. 52. This is a point Tocqueville will repeatedly return to throughout the course of Democracy in America. For him, it explains why America’s democratic experiment had been such an incredibly wild success whilst all European attempts had thus far proven to be deadly disasters. The Americans learned how to play the Democratic game in their churches and front porches. Engagement at the local level allowed each man to become a citizen capable of participating in public affairs. Like building blocks, each community of engaged citizens could then combine their efforts to create and sustain the larger whole. Local republics were the foundation on which the Union was constructed. The approach taken by European democrats was radically different. Theirs was an attempt at revolutionary change directed from the top. Through their wisdom and virtue men of the Assemblée nationale would pull the rest of France into democratic paradise. Never fail to remember that a nation cannot remain strong for long when each individual man is weak, and that we have still not discovered a social formula, more any political ruse, which can turn a nation of small-minded and flabby citizens into one that is full of energy. The French were not ready to govern themselves. I believe Tocqueville would say that they were incapable of it. Not having had the experience of self government on the small scale, they were utterly unprepared for it on the large. The experiences of France and America are worth keeping in mind when we discuss democratization today. How shall a country like China democratize? Regime change? A democratic revolution? I would not put my hopes in them. Much more comforting to me is the massive democratic experiment Chinese villages have taken part in for the last twenty years. As did Tocqueville, Chinese reformists realize that if citizen governance is to be established in any country, it must start at the bottom. The most enduring and uplifting social transformations are incremental in nature. They take time. The real question is if the rest of the world is willing to wait. *H/T to a Mr. Theodore Roosevelt, who wrote in his September 12, 1902 editorial for Outlook Magazine: “Men can never escape being governed. Either they must govern themselves or they must submit to be governed by others.” Wise words from another man of wit and wisdom. ADDENDUM (16/4/10): A reader forwards this essay by AEI fellow Robert Gannet. Like this piece, his essay concerns Tocqueville and Chinese village democracy. Unlike this piece, it has more than 4o citations to support the argument. I recommend giving it a read. I like ecology. It is a fascinating subject, and it deserves much more credence than many will ever allow it. Its importance is hard to contest: long before man played any part in sizeable political or economic systems, he was a node in the Earth’s many extensive ecological networks. It was upon these networks mankind built his civilization, and it is upon these his continued survival depends. David S. Woodruff. Biodiversity and Conservation. 3 February 2010. According to this very article, intensive forest clearing has been common practice in Southeast Asia for 2000 years. Agricultural societies have existed in the region for at least 5,000 years. Modern humans have lived in the region for more than 40,000 years. For tens of thousands of years the ancestors of those living in Thailand have been an active part of its ecosystems. How can Western ecologists justify claims that these people are not a part of nature? By appealing to tradition, of course. The idea that man is fundamentally different from the rest of creation has deep roots in Western culture. For centuries we have divided the world into parts civilized and savage, places created by man and places of the untamed wild. For the great majority of the last three centuries this distinction was expressed in terms of glorious triumph: man had “conquered” the oceans, “mastered” the elements, “overcome” the ravages of nature. The last fifty years have seen this narrative turned on its head. The environmental movement was the vanguard for this – they sought to radically realign the way man’s relationship with nature was seen, talked, and thought about. Now man, ‘destroyed’ natural resources, ‘hurt’ the environment, and ‘exploited’ nature. Man the Victor had become Man the Oppressor. The great irony in all of this was the narrative really had not changed at all; both stories were tales of conquest and both were expressed with the vocabulary of subjugation. The only real difference between the two was the moral judgment tacked on at the end. Substantive change in the narrative would be much harder to achieve. Such change is difficult to achieve because it requires a radically different perspective. To view the relationship man has with his environment with objectivity, we must stop looking at the relationship as human would. I suggest a broader perspective: the ecosystem itself. Ecosystems are dynamic nonliving systems. Because they are nonliving, they do not have interests, desires, needs, or possessions. * An ecosystem does not care if it experiences an explosion in biodiversity or it is inflicted with a series of devastating extinctions. It simply exists. And because it exists as a dynamic system, an ecosystem can experience any number of extinctions or explosions and remain an ecosystem. Short of the destruction of all biotic interactions in an environment, this ecosystem will always be an ecosystem, though its various components may differ from time to time. This also means that no ecosystem possesses an ideal or natural state of ‘balance.’ As dynamic systems ecosystems can exist in an infinite variety of forms; as nonliving and unconscious things ecosystems cannot select a preference among them. Given that no ecosystem has an ideal configuration, it is impossible for outside forces to exploit or damage the ecosystem in anyway – they can simply change it from one configuration to another. Indeed, the entire notion of ‘outside forces’ is a curious one. By definition, an ecosystem is the sum of all interactions and relationships existing between organisms and abiotic factors in a given environment. Thus anything – be it a parasite or an asteroid – that interacts with any part of the system is in that moment of interaction part of the system itself. This rule is not suspended for mankind. From the viewpoint of the environment, man is just one biotic factor among many. His relationship with other parts of the system is not categorically different than those of other species. The things he builds are not categorically different than those built by other species. Cities, roads, power plants are termite mounds and beaver dams on a larger scale. In this sense any division between things ‘natural’ and ‘artificial’ is disingenuous. Man is a product of nature. Because of this, anything he builds is natural. Anything he destroys is natural. Anything he changes is natural. Humanity is a natural process. Artists, merchants, philosophers, priests, and politicians can pretend otherwise. I do not begrudge them for this; it is through our dreams of singularity we find meaning. Scientists, when working as scientists, are not allowed such liberties. The scientists seeks to understand the world objectively – the Universe on its terms, not ours. Thus my quarrel with the ecologists. *Or perspectives. I ask you overlook this for the sake of the thought experiment. War and Peace and War: The Life Cycles of Imperial Nations, Peter Turchin's sweeping application of cliodynamics to the rise and fall of great powers, has been making the rounds recently. Both the Committee of Public Safety and Sublime Oblivion have posted responses to the book. As my past posts on cultural cohesion might suggest, I am quite sympathetic to any who approach great power politics from the standpoint of social solidarity. War and Peace and War promises to do just that. These two posts have only put the book higher on my reading list. Antoly Karlin. Sublime Oblivion. 8 April 2010. "Joseph Fouche". Committee of Public Safety. 11 April 2010. "Fabius Maximus". Fabius Maximus. 31 March 2010. Fabius Maximus points to a painful truth: increasing inequality of income and declining social mobility is tearing our America apart at the seems. A Republic, you say? No, ours is plutocracy. Glen Whitman. CATO Unbound. 5 April 2010. A long essay on the contradictions of the new paternalism popular with behavioral economists. If you have the time it is worth the read. Anthony Gregory. The Independent Institute. 30 March 2010. Richard Solash. Radio Free Europe. 30 March 2010. The low coverage these stories received mystifies me. The establishment of this fuel bank was a greater diplomatic victory than for the Russians than any of the arms agreements that have been in the news of late. The bank gives Russia no small amount of leverage over any country that wishes to use its contents. The certification of Gazprom's North Stream pipeline will offer similar benefits. Praveen Swami. The Hindu. 22 March 2010. Sheikh Abul Bashar hoped, Gujarat Police investigators say, to deepen the bombers' theological understanding of the war they were engaged in. He came armed with Salamat-e-Kayamat, an evangelical video replete with scriptural prophecies of the triumph of Islam before the day of judgment. He also acquired a copy of Faruk Camp, a paean to Taliban rule in Afghanistan, from Usman Aggarbattiwala, a young commerce graduate from Vadodara's Maharaja Sayaji University who allegedly programmed the integrated circuits used as timers for a separate set of bombs planted in Surat. Bored by the religious polemic, though, Bashar's students turned instead to Anurag Kashyap's movie Black Friday — a riveting account of just how a group of hard-drinking, womanising gangsters carried out the 1993 serial bombings in Mumbai to avenge the anti-Muslim riots that that tore apart the city after the demolition of the Babri Masjid. More evidence that Islamic terrorism - at least among the rank and file - is hardly about Islamic theology. Read the piece in full for more on this point. Nicolai Ouroussoff. The New York Times. 30 March 2010. I would keep on eye on this project. If successful, it will likely set the pattern for development and reconstruction projects the world over. The Economist. 31 March 2010. "Texas in Africa". Texas in Africa. 5 April 2010. Jason Sterns. Congo Siasa. 5 April 2010. Leigh Ewbank. The Breakthrough Institute. 1 April 2010. "Jfxgillis". Correctly Political. 19 March 2010. The President's Pen is Missing! "Jfxgillis". Correctly Political. 26 March 2010. For now, the fate of the Blue Dogs is sealed, their doom is at hand. They can't save themselves voting this way or that, or collecting money from this lobby or that, or running attack ads against this opponent or that. Their problem is far too profound to solve with such petty and trivial machinations. For those interested in the future of our party system (a hot topic of late), this is a must read. "Christian." OKTrends. 31 March 2010. The most stunning set of political graphics I have seen this year. And they are from a dating site! Mark Thompson. League of Ordinary Gentleman. 1 April 2010. Again – I’m not looking for civility or nuance or anything of that nature. Public political discourse is and will always be nasty and ugly, even if it’s far better than the alternative. Instead, all that is required for an effective and non-violent political discourse is two sides who fight by responding to actual arguments, however wrong those responses are, rather than just repeating the same rote response over and over again or feigning victimhood. This one deserves a full read. Hail Columbia: America's Original National Anthem (And How it Illustrates the Evolution of American Nationalism). Brad Hall. American Creation. 10 April 2010. Stephen Morillo. Journal of World History. 1995. A fascinating account of the early modern "military revolution" as experienced in Medieval Japan. It occurs to me that the same approach can be used to explain the Warring States explosion in army size as well. That, however, is a project for a different day. Author's Note: A few days ago I finished reading Europe in Crisis, 1598-1648, by Geoffrey Parker. Parker is a renowned scholar of 17th century Europe, and for those unfamiliar with the period’s history I can think of no better introduction than this volume. This reading was the impetus for the following post. You can summarize the history of the Second World War in two paragraphs. Squeezing the causes, campaigns, and countries of the war into these paragraphs would be a gross simplification, but it is possible. This does not hold true for the Thirty Years War. It is one conflict that simply cannot be related in a paragraph. The number of actors involved, the myriad of motivations and goals of each, and the shifting alliances and intrigues between them all are simply too complex to be stripped down to a single page. * Piecing together the events of the Thirty Years War inevitably takes up much more time and effort than single page summaries allow. To look at this in a slightly different light: understanding the Thirty Years War is more psychologically demanding than understanding World War II. There is a fundamental mismatch in the cognitive capacity needed to engage in the serious study of each. The implications of this are worth contemplation. The great majority of policy makers are familiar with the Second World War. If asked to, I am sure that most folks in Washington concerned with foreign affairs and security policy could provide an accurate sketch of the countries and campaigns involved. Indeed, we conceptualize current challenges from the standpoint of World War II; allusions to it are the lifeblood of both popular and academic discourse on foreign affairs. Pearl Harbor, Munich, Stalingrad, Normandy, and Hiroshima are gifts that keep on giving – they serve as an able metaphorical foundation for any point a pundit or analyst wishes to make. Are the United States and China Headed for a New Cold War? "T. Greer." The Scholar’s Stage. 8 February 2010. It is through the lens of 20th century great power politicking that we view the world. The great power exchanges of the last seventy years form the basis of America’s modern historical experience; these experiences inform the narratives and theories we use to explain how the world works, influence the fundamental assumptions of the American approach to international affairs, and form the foundation of our world view. Both the conceptual and institutional framework of our strategy making apparatus is built on the expectation that the international scene will be dominated by firm and definite great power alliances. This Weltanschauung served us well over the course of the last century. I am unsure it will be as valuable a servant in the next. We must be wary lest our selected historical metaphors become a conceptual restraint that dangerously limits our cognitive capacity in general, and our capability to develop successful strategies in particular. Consider the war America wages at this very moment. For the past few weeks I have busied myself constructing a basic introduction to the goals, attitudes, and objectives of the actors involved in insurgency in Afghanistan. What a daunting task this has proved to be! That conflict is an incredible interconnected web of movements, men, and meddling great powers that defies simplification. Just the list of actors integral to the conflict betrays its dizzying complexity – somewhere between the Haqqani Network, Quetta Shura, Hezb-e-Islami, Karzai and the Afghani government, the United States, her two dozen allies in the ISAF, Pakistan (itself divided into the ISI and the civilian government), the Indians, the Iranians, the Tajiks, the Uzbeks, the Kyrgyz, the Russians, the Chinese, and several foreign NGOs and terrorist groups, comparisons to the Second World War start to lose their power. Why do we think of our world as if it were another 1938? Given circumstances this hardly seems appropriate - the true metaphor for our time should not be 1938, but 1638. Do not fear – what follows is not a tired comparison of Palatine and Kandahar. The material conditions of the conflicts that have raged in each are hardly comparable. The complexity of these conflicts, however, are. And in this lies the cause for worry. What has prepared modern statesmen to face such convoluted affairs of state? We spent much in the search for the next Kennan and Marshall; how goes the search for the next Richelieu? Every policy maker can give you a sketch of the Second World War. How many can even attempt to sketch out the Thirty Years War? 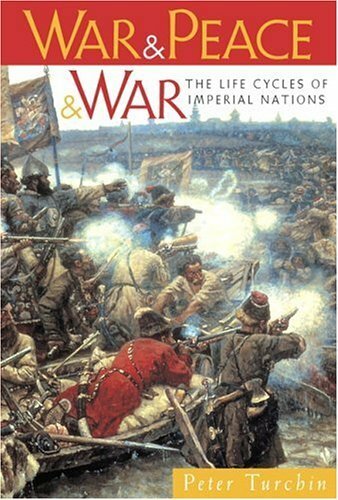 *To provide an example, this this bare bones accounts of the war is about five pages in length. Wikileaks edited and presented this incident in a manner that can be called nothing but blatantly dishonest. This video presents portions of the full 40 minute video that Wikileaks left out. At this moment it has received 500 hits. The Wikileaks video has received 5 million. I ask my readers to spread this video to the best of their ability. While I do not condone the reckless actions of these aviators, their side of the story needs to be told. The record needs to be set straight. "MK." Inkspots. 5 April 2010. The comment thread on this post is informative. Matt Armstrong. Mountain Runner 9 April 2010. On DoD's utter inability to grasp the importance of social media. Further on the Wikileaks Iraq Footage. James Fallows. The Atlantic. 6 April 2010. Fallows points out what should be obvious: as long as America is engaged in messy urban counterinsurgency campaigns, this will happen. Human Rights Watch. 8 September 2008. US and NATO forces have been far more likely to cause civilian casualties in unplanned situations, normally when ground troops call in airstrikes as tactical support when under attack from insurgent forces, or to target insurgent forces on the move. The vast majority of known civilian deaths and injuries from airstrikes in Afghanistan come in these situations. Often these situations involve "Troops in Contact" (TIC). A TIC is an unplanned engagement occurring when US or NATO ground forces unexpectedly come into contact with insurgent forces. While the report was discussing air strikes in Afghanistan, the same dynamic is at play here.